Why? Why? Why? It’s a question I often ask myself about the treatment of the creatures on this earth and it was also a question that came to me many times whilst reading this collection of short stories. Why does man wreak so much havoc on the earth? Why are we so cruel to the living creatures we share our world with? 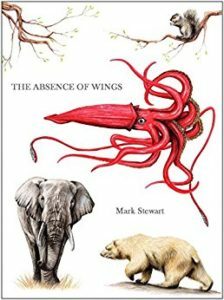 Mark Stewart’s stories look at the fates of, amongst others, a shark, whale, rabbit, squirrel, polar bear, rhino and elephant. Creatures great and small and all hunted or mistreated in some way. When the author approached me to ask me to review this book I asked him if it would break my heart. He said no, but that I might shed a tear. I didn’t do that but I felt an overwhelming sadness. The stories are very literary in style, quite wordy and I struggled with that a bit, but they’re also lyrical and moving and it’s obvious Stewart cares deeply about the natural world. I’ve long been a supporter of various animal charities, finding it hard to comprehend the cruelty in the world. If you care too then you will find these stories well worth a read. Not an easy read at all but the reader is put right into the heart of each story, imagining how each creature feels. It’s heartbreaking stuff and The Absence of Wings is an important lesson to us all in how to behave and how not to behave. I’ve just today read a guest post on the Chat About Books blog. I hope you will also go and read it. Mark Stewart talks about his feelings about the treatment of animals and it made his reasons for writing The Absence of Wings even more clear to me. I believe it was Paul McCartney who said that if abattoirs had glass walls we would all be vegetarians. Sadly I don’t think we will ever see a world where animals are not used and abused for the benefit of human beings but I wish we could all put a lot more thought into how we treat them. If you’d like to read the stories for yourself then you can buy them in paperback and ebook from Amazon. 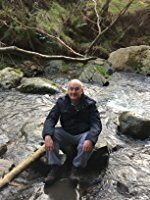 In 2014 he won the Sir Patrick Moore Medal for services to the British Interplanetary Society where he founded and edited the e-magazine, “Odyssey”, for two and a half years. His articles and essays have been published in “Spaceflight”, “Astronomy Now”, “Foundation” magazine, and the journal of the British Astronomical Association. He now lives in the Surrey hills; members of his non-human family include rabbits, horses, foxes and hedgehogs.